In the second half of the 20th century, sports and television developed a synergistic relationship that transformed both in multiple ways. The course of that relationship was in large part driven by the emergence of ABC Television Sports under the leadership of Roone Arledge. During the 1950s, the ABC Television Network struggled to compete with the larger and well-established NBC and CBS networks. It had significantly fewer affiliates and operated on a meager budget. It was little more than an afterthought in the television industry. In some quarters, it was referred to as the “Almost Broadcasting Company.” Midway through the decade, ABC changed its programming strategy with the advice from media experts and an influx of capital after it was acquired by United Paramount Theaters. As a professor Journalism and Mass Communications in the American Studies program at the University of Iowa, Travis Vogan is well prepared to take on this important subject. Vogan’s analysis of the rise and fall of ABC Sports Television begins with the initial growth of the network and the decision to focus on sports as a path to competitiveness with the larger networks. There were many factors in the success of ABC, but central to its emergence in the industry was the development of ABC Sports under the leadership of Roone Arledge. Beginning with the production of NCAA Football, Vogan’s focus on Arledge’s contribution to ABC is skillfully executed. Arledge believed that sports were a significant element of culture and deserved a treatment in the same vein as music, fashion, and cuisine. His vision was put forward in a memo outlining his plans for televising NCAA football. It has become a legendary document in the industry. Within the world of college football, Arledge created production formulas that became a hallmark of ABC Sports, not just college football. Such features as “Up Close and Personal” became part of the distinctive ABC style. For him the game itself was only one element among many in the telecast of a sporting event. Vogan’s highlighting of Arledge’s philosophy and contributions in this realm constitute the opening chapters of ABC Sports. After securing the American Football League contract, ABC Sports developed “ABC’s Wide World of Sports,” a weekend program focusing on fringe sports in all corners of the globe. It was low budget, low profile sport as dramatic programming. Before long, the opening words and video became nearly a byword across the country: “Spanning the globe to bring you the constant variety of sports. The thrill of victory. The agony of defeat. The human drama of athletic competition.” Arledge’s focus was on the “human drama” more than the sports. The Cold War served as a lure and a hook when “Wide World” offered extensive coverage of the U.S./Soviet track meets in the early sixties. It established an audience and proved to be a winning formula. Vogan adeptly follows this development and its many consequences, including the emergence of Jim McKay and Howard Cosell as significant story tellers and commentators at ABC. This success seemed to lead naturally to ABC’s branding of itself as The Network of the Olympics. At times, it seemed as if The Olympics was just one more programming option for “Wide World.” Vogan tracks and explains this development and its consequences not simply for ABC Sports, but also, in the wake of Munich, for ABC News. Vogan also chronicles the relationship between Muhammad Ali and Howard Cosell and its significance to the network, as well as the careers of both men. Equally important to ABC’s standing in the major network competition was the coming of Monday Night Football (MNF). 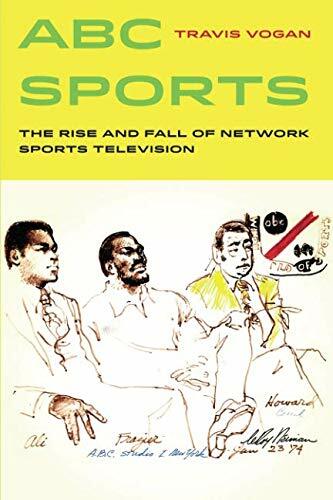 Vogan examines how MNF, the choice of Cosell and Don Meredith as commentators, and the particular character of production styles came together to make MNF “appointment television.” Vogan’s view of the origin of MNF is one explanation, but it should be pointed out there are others. Perhaps this is because success always has many claimants. Vogan’s account of ABC’s coverage of the 1968 and 1972 Olympics is particularly well executed and full of significant detail. ABC does not emerge unblemished in this analysis, yet there are clearly heroic elements especially in the Munich coverage. The decline of ABC Sports is much less glamorous, but in Vogan’s narrative, certainly significant. The coming of cable sports, especially ESPN, and its consequences for ABC Sports is detailed. The purchase of ABC by Capital Cities and, then, the acquisition by Disney has multiple consequences of its own, and Vogan explains these clearly. All in all, this is a book that has much to commend it and little to criticize. It is built on meticulous research and a strong overall conception of the significance of the subject. For the specialist in history or media it is essential. For the non-specialist the comprehensive scope and level of detail may be too much, but there is enough sharp, humorous, and relevant anecdotal material to carry the day.